Patellofemoral Syndrome - Knee Pain " Brooke is a 15-year-old female volleyball player "
Brooke is a 15-year-old female high school volleyball player visits a sports medicine physician complaining of a 2-year history of bilateral knee pains. She has no swelling, locking, or giving way of the knees, and there have been no serious injuries, but she hears “crunching” as she bends her knees or when she lands from jumping. Although she hasn’t missed any games, Brooke has to ice her knees afterwards, and has been taking 2 tablets of ibuprofen before and after games. Her main concern is an upcoming tournament, where she’ll be playing up to 4 matches each day for 3 days. On examination, she has crepitations (crackling sounds) on active range of motion, and passive full flexion is painful. She has flat feet, and internally rotated patellae (kneecaps). Her IT bands are tight, and her glutes are weak. She is unable to squat on one leg alone due to pain. Brooke could benefit from physiotherapy to work on her strength and flexibility, an orthotics provider to fit her for orthotics, and a bracing specialist to consider patellar stabilizing braces. Her sports medicine physician may also order any imaging tests in order to help determine the full extent of her condition. 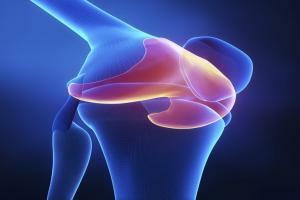 Patellofemoral Syndrome - A Common Knee ConditionDr. Grant Lum, MD, CCFP, Dip Sports Med, Sports Medicine Physician, discusses patellofemoral syndrome, diagnosis and common treatment options. A sports medicine physician's primary focus tends to be on the diagnosis, treatment and prevention of injuries that occur during sports and other physical activity. A sports medicine physician can help you assess and manage your knee pain and patellofemoral syndrome. A pedorthist is a medical provider who has taken specialized training in the design, manufacturing, and modification of footwear to address conditions which affect the feet and lower limbs, such as patellofemoral syndrome. A bracing and equipment specialist can help fit patients with braces to help manage knee pain and patellofemoral syndrome, and are trained to educate patients on these devices. A personal trainer has achieved a level of certification and qualification in order to help people exercise safely with conditions such as patellorfemoral syndrome. A physiotherapist is trained and certified to work with patients to treat injuries and dysfunctions. They can work with you on range of motion and pain management, and can help with pain resulting from patellofemoral syndrome. A radiologist is a physician who specializes in interpreting medical images through x-ray, CT scans and MRI's, and can help assess your knee pain to determine if you have patellofemoral syndrome. A chiropractor takes a manual approach to treating various conditions of the musculoskeletal system, including patellofemoral syndrome. Conversation based on: Patellofemoral Syndrome - Knee Pain " Brooke is a 15-year-old female volleyball player "
It is a degenerative process that results in relatively rapid deterioration of a joint. It generally affects people in their 60s and 70s, but can also occur among those in their 50s and younger. In most cases, a regular exercise program designed to maintain flexibility, muscle strength and endurance, will help people maintain their normal activity level. Reply to: Patellofemoral Syndrome - Knee Pain " Brooke is a 15-year-old female volleyball player "
How long would physiotherapy take to correct this issue? A brace is always a good option if you have had surgery on the knee or you think you are doing long-term damage. Repetitive injuries like hers might benefit as long as it does not make her favors her knee. Wouldn't an injury cause you to favor the knee that is causing you pain anyway ? Would Brooke have to get a special brace to wear while playing volleyball ? She could ice after each event as well to help swelling. What is the benefit of wearing orthopedics when you have Patellofemoral Syndrome ? 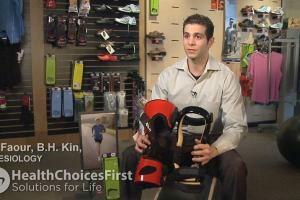 Will wearing them reduce swelling and assist with pain management ? I have flat feet and, while I don't have knee issues, I do experience knee pain if I am wearing certain types of shoes for a long time. I have to be sure to switch out my supportive shoes with orthotics for things like cute ballet flats and sandals to avoid knee pain. If you have knee pain and have been diagnosed with flat feet that cause your ankle to drop inward (pronation syndrome) when you stand or walk, then yes, orthotics can alleviate pain and swelling around your knee. The main function of the orthotic is to assist the body in regaining proper lower extremity biomechanics, and provide some shock absorption. It is not the only treatment you should undergo as you should implement an exercise regime to strengthen the VMO (vastus medialis oblique) muscle of the quadricep, as well as localized inflammation and pain management of the knee. Is Patellofemoral Syndrome hereditary ? With patellofemoral syndrome, a good drop squat program can be very effective in helping treat the knee pain. I would definitely assume a physiotherapist or exercise specialist this girl would be working with would have her doing some type of squat program as part of her rehabilitation. Very interesting Kimberley! So does the cartilage reach a maximum thickness at a certain age and then start to degrade as we get older again? I'm not certain but I would assume so. Patellofemoral is very common among teenagers is it not (because they are growing.. like growing pains)? When my daughter hurt her knee at age 16 we were told that girls of that age had less cartilage which is why they are more prone to injury. @michelle, good point about getting patellofemoral syndrome and whether it is related to flat feet checked out. Potential bilateral knee pain issues should be addressed when teenagers are growing. Otherwise, it can become worse later in life. Is obesity a risk factor for Patellofemoral syndrome? With the legs - all of the components are tied together more than any other part of your body. They support the body weight, and deal with motion. So the knee needs to be protected by the IT band, and the quads, and the all the muscles, and ligaments of the leg. Even though it is common - it needs to be addressed now, and taken care of. It is sad to see so many young kids with knee pain (which usually lead to lifelong pain and issues). It's very likely that her anatomical issue of flat feet have caused knee discomfort over time. I would be concerned given her age, and think it's best if her parents encourage her to seek assessment and treatment. She has a lot of years left on those knees! I would also encourage she consult with a sports medicine physician to determine if any scans or images need to be taken to fully investigate the cause of her knee pain.